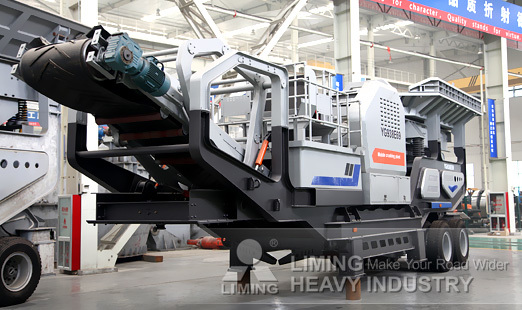 The mobile jaw crusher further develops the very latest technology used within the Q-range of mobile jaw crushers manufactured by LIMING. The mobile primary jaw crushers are characterised by their uncompromising design and sturdiness. Its compact size, enhanced mobility and high crushing speed together with large feed opening provide impressive rates of production and is able to sustain superb reduction ratios. 2.Danfoss hydraulic control system for excellent efficiency with all controls located at ground level for ease of access and maintenance. 3.Full PLC control system and Danfoss colour screen allowing visual data output of all plant operating parameters. 4.Improved load control system for feeder drive to ensure continuous, uninterrupted crushing. 5.Level sensor fitted to jaw to control feed rate into the crusher thereby maximising production. 6.Hydraulic raise and lower facility on the main conveyor to give increased clearance for rebar discharge in recycling applications. 7.Steel pipe work used extensively to give superior heat dissipation and to provide a maintenance free sealing solution. 8.Speed wheel fitted to main conveyor to stop the feeder, negating the need to dig out a heavily loaded conveyor. 9.Now fitted with a hydraulically driven oil cooler capable of operating in the most hostile environments with a 50°C ambient temperature capability without any oil changes. 10.Hydraulically driven cooling fan allows fan speed control to give increased efficiency and auto reverse facility to periodically back flush any dust build up in the radiator. These new features are aimed at ensuring the mobile jaw crusher is now as user and environmentally focused as it is productive and versatile. The mobile jaw crusher is designed to be equally productive in both hard rock and recycling applications and is therefore the ultimate all round workhorse providing maximum efficiency and productivity whilst minimising cost of ownership.